“Group of Death” first stage of the competition when they played the mighty Millfield school and the defending champions Wycliffe College. 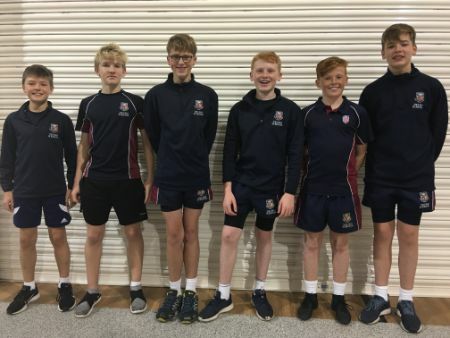 This was a controversial grouping as it is rare that 3 such strong school meet outside of the latter stages of the event, but our team tackled the monstrous challenge with pride and passion, playing superb attacking. Squash against some of the best school-boys in the entire land. The first match was against Millfield which saw a winning debut for Ed Hayes at 5th string and a first victory for Ollie Beaumont, who will now go from strength to strength at no 4. Joe Thompson took a well deserved win at 3 and our top stars Louis Murray/Jack Mahon cruised effortlessly through their matches at the top of the order to give us a 5 strings to nil advantage and more importantly an overall points score of 151-56. In simple terms a massive margin of victory! Straight after this match we played National no1 team Wycliffe, who were incidentally completely fresh, in what the England Squash official on site described as “ One of the best school match played in years”. At no 5 string Callum Oliver made his debut in fine style by grinding out a tight win and start the ball rolling. Simultaneously our no 4 and no 3 players Ollie Beaumont and Joe Thompson then battled on adjoining courts but to no avail, despite huge endeavour, leaving us 2/1 down in strings and a considerable points deficit. Enter the razor-sharp skills of Louis Murray and Jack Mahon, our top ten national standard players, who both played outstanding squash to win their matches and force a points count back in order to determine the result. In the final reckoning, despite winning 3 strings to 2, we were pipped 122-118 and finished group runners-up, comfortably qualifying for the final elimination round before the Grand Finals in March.